Pixar has done it again - with 'UP' - a heart-touching story, amazing screenplay, with cleverest talking animals and what not! I absolutely adore the Russell kid in the movie. He is sooo cute!!!. The best part of the movie though was a lovely dialogue-free montage, in the beginning of the film which follows the sweet relationship of Carl Fredricksen and his wife Ellie - from their contented marriage to old age. It a highly recommended movie for everybody and I thoroughly enjoyed it!! I used - couple of small cherry tomatoes, chopped onion, bell pepper and mozzarella cheese. In a large mixing bowl, add flour, instant dry yeast, salt and oil. Make a well in the middle and add water little by little to make a dough. Remove from bowl and knead. Place in a clean oiled bowl and let rise, slowly, about 2 1/2 hours. Knead, divide dough into 2 portions, let rise again for 1/2 hour, and then roll out as desired. Add pinto beans, rosemary sprigs and onion to about 3-4 cups of water & bring it to a boil. Puree drained beans and onion, sun-dried tomatoes and chopped rosemary in processor. Add oil, lemon juice, salt and pepper, puree until smooth paste. if desired, add 1/2 cup boiling water while blending in the processor. Ready to served as a dip or a spread. Pre-heat oven to 400 deg F.
Roll out the pizza dough into desired shape. I ended making a rectangular one. Lightly sprinkle the pizza peel (or a flat baking sheet) with corn meal. Place the flattened pizza base on to the baking sheet. Spoon on the bean puree, place the veggie toppings and sprinkle lots of cheese :). Bake for 10-15 minutes. Serve warm !! Before signing off, there is a sweet treat to you all - Blueberry Pound cake :) made by Shri, who is a very dear friend of mine!! Have a great Sunday ahead. Pizza loks great Siri! You even made the dough from scratch! Can u send me some? The pizza looks realy yummy. I have never had bean puree. Yummy Pizza.You made from scratch!Awesome.Never tried bean puree with Pizza. Bean puree is a nice twist for a pizza. Will try. Pics look great. Thats looks fantastic! U seem to becoming a real PIZZAIOLO!!!!!!!!!!!!!! cool girl! Beans on pizza is one of my favorites and sun-dried tomatoes are always an excellent choice. Siri, The pizza looks so damn gooood, makes me very hungry. Absolutely mouthwatering, and I am no kid!! @ Parita: Bean puree base give the pizza a very different taste. Do try it sometime. @ Happy Cook. Thanks HC. @ Mona: Up was a fantastic watch Mona and I am surely gonna get a DVD when its released!! WOw nice yum recipe with a beautiful click. 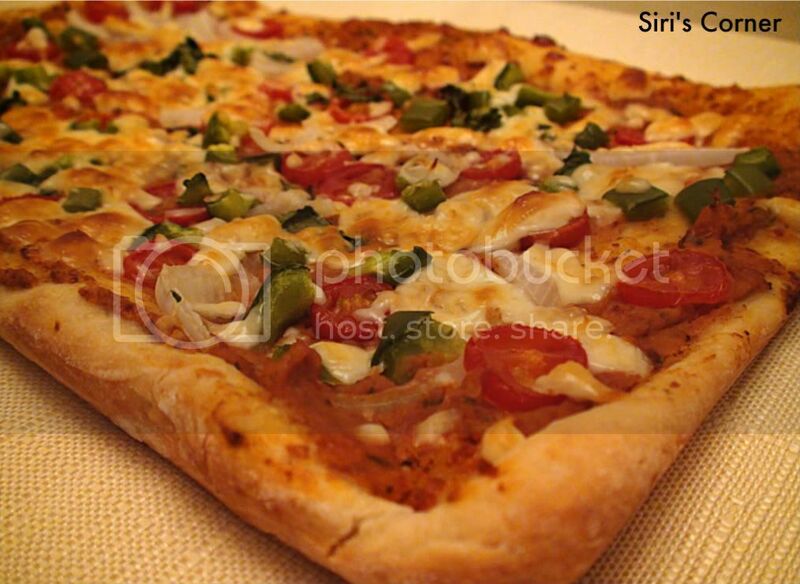 Nice shape Siri... Its been ages since I made pizza you are tempting me and the pic is drool worthy!!! That's an interesting and healthy twist Siri. 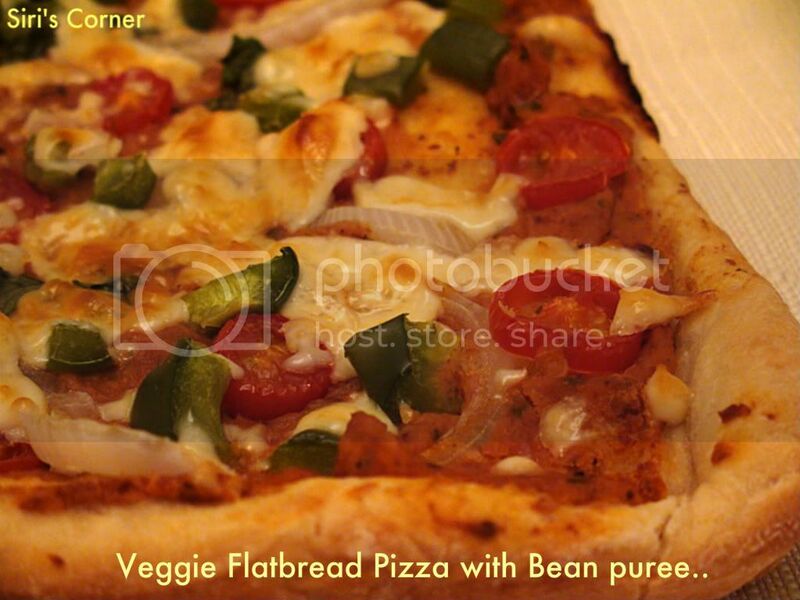 Very interesting idea using bean puree in pizza, and it looks just perfect ! Love your take on the pizza.It looks lovely!Also, thanks much for mentioning my blueberry cake recipe.Appreciate it:)Have fun and look forward to seeing more fun recipes. Pizza looks inviting siri! !Drop in sometime!! Dear Siri, What a pizza...like the pintobeans in the spread very much. That picture removes all thoughts of dieting far away from the mind. Cheers!